Astronomers observed the reflected light from asteroid 24 Themis with NASA’s Infrared Telescope in Hawaii. The spectra suggested that its surface contains ice. Themis has a diameter of about 200 kilometers and orbits twice as far from the Sun as Mars. In 2013, astronomers discovered that the centaur Chariklo is surrounded by two ice rings. 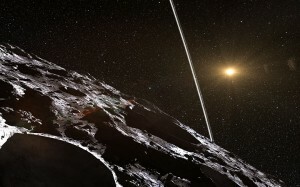 Image credit: NASA Artist’s impression of Chariklo with its double ice ring and the Sun in the background. Why should an asteroid have ice rings or ice on its surface? The answer depends on the origin of asteroids and comets. The accepted scientific story is that comets accreted from ices while asteroids aggregated from space dust. The Earth supposedly swept up lots of dust until it got big enough to melt its interior. Ancient societies thought things spread out instead of gathered together. The Babylonians wrote that the North Wind (perhaps o moon) of Jupiter (Marduk) slammed into the watery Tiamut and split her like a shellfish. If that really happened, most comets and asteroids should be pieces of the shattered planet. Isaiah wrote that the shattering of Rahab (mighty, stormy) happened in the generations of long ago (Isaiah 51:9). Job 26:12-13 mentions how the heavens trembled when Rahab was crushed and the fleeing serpent writhed. Both Isaiah and Job used the imagery of a sea serpent for the crushing, similar to Ugaritic descriptions. (If a watery planet was crushed – each major piece should have been followed by a vapor trail – perhaps looking to the Canaanites like a multi-headed sea serpent). The drawing of a shattered planet is from NASA. Indeed, tens of thousands of irregularly shaped rocks circle our Sun. Eros has rock cliffs and intersecting faults that result in square craters. Some asteroids have moons, something no scientist can mathematically explain. Yet it would be natural for some adjacent pieces to orbit each other immediately after the shattering. 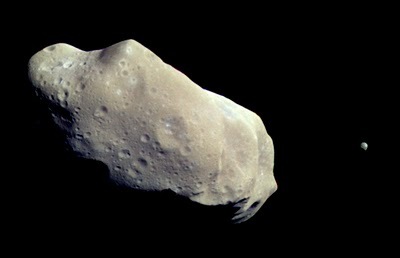 The asteroid Ida and its moon Dactyl have similar compositions. Photo: NASA’s spacecraft Galileo took this picture in transit to Jupiter in August 28, 1993. Notice Ida’s angular shape and its tiny moon Dactyl in the background. 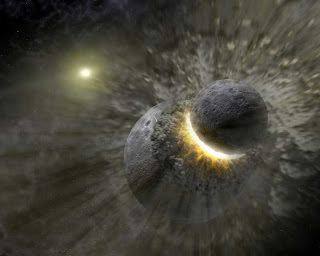 Asteroids could only capture a moon if they were adjacent to each other when a planet was shattered. Asteroids and comets contain crystals similar to those we find in volcanic rocks on Earth. Such crystals could not have grown from space dust. The Wild2 comet and some meteorites contain cubanite, a rock that forms in warm water. Eros and Wild2 have flat bottomed dust ponds, apparently the remnants of water ponds that sublimated away. These suggest that comets are parts of a watery planet that broke apart. NASA’s rovers examined several nickel iron meteorites lying on the surface of Mars. Nickel iron is thought to come form the molten core of a planet. How do you get the core of a planet to spread around the solar system unless it was shattered? Our early ancestors believed that planets once passed at close range. Judges 5:20 mentions a close passage:[the stars (planets) fought from their courses. Joshua 10:13 describes an astronomical event similar to the Greek Phaethon story. Phaethon may have been a planet that, during a close passage, caused the apparent position of the Sun to swing around in the sky. According to the Greeks this produced fires, falling rocks and surging floods. The falling rocks and the Sun and Moon remaining in the sky for about a day are also mentioned in Joshua. (If a planet passed close the Earth, our spin axis would precess, causing the Sun to appear to swing north and south during the close encounter). We observe in cosmic history how billions of galaxies (at many ranges) continue to spread out from what originally was unformed matter. Galaxies cannot intrinsically grow into huge, local growth spirals unless the properties of matter are emerging, changing relationally. According to the Hebrew text of Genesis1 the fourth day, God continues (imperfect verbs) to form the Sun, Moon and stars and continues to form them into raqia. Raqia is a noun: something that spreads out. The Bible uses the metaphor of a tent being spread out for God’s continual spreading of the plural heavens (Isaiah 40:22). How could solar system spread out? Perhaps the objects in the solar system accelerated outwards in the same way as we observe star streams moving out in billions of galaxies. Why should orbits move outward? You can read about gravity aberration on this web site. What is gravity? In general, the fastest atomic clocks are local ones. Even local atomic clocks, when compared to their transponded reflections from hours ago (the Pioneer Anomaly) also accelerate relative to their previous rates. Indeed, local atomic clocks are observed to accelerate in the same manner as the clocks in hundreds of billions of distant galaxies (that is – relative to distance). The most distant bodies, whose light came from the primordial past, shine at 10% of the frequencies of modern atoms. Perhaps gravity is what emerges from matter as it changes relationally. What is the evidence for relational change? It is not just the atomic clocks that speed up. Matter’s inertial properties and its volume also keep changing as galaxies grew from the insides outwards. How can know this? When we compare the shape and light colors from galaxies at many ranges we observe how they grew as the properties of matter concurrently change. Intrinsically growing galaxies contradicts every law of modern physics. Relational change is where the properties of matter change together, in parallel. Such changes are not measurable with precision units because it affects everything – even the operational definitions, measuring units, mathematics and instruments. Yet relational change is visible in visible cosmic history. Scientists tell just-so stories about how the universe is 99% invisible. They imagine that the vacuum of space time stretches light and that 84% of all matter is invisible. They even claim that stars, asteroids and comets accreted out of space dust. What we observe is the opposite as billions of galaxies intrinsically grew from a core of primordial matter that was unlike the matter we see locally.